The trick to impressive integration of any eye catching furniture piece into the room is to have at least one more piece that has similar design. 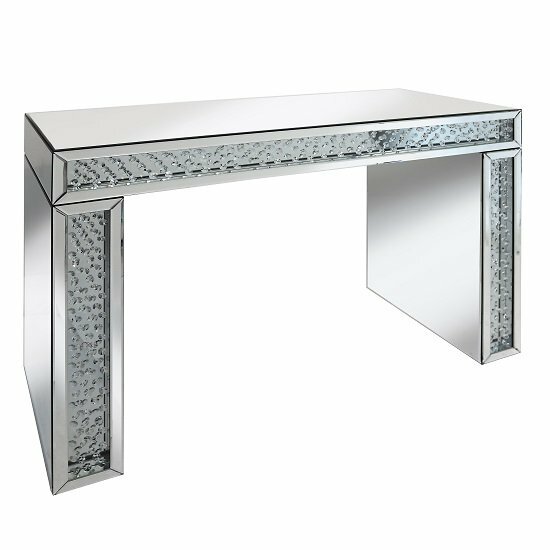 In case of a glass mirrored console table, a TV stand with a glass mirrored door or a coffee table with glass mirrored top will be a logical pair. Despite the growing popularity of warm golden shades in new furniture collections, mirrored furniture calls for cold silver shades to make room environment logical and impressive. Anything, from furniture legs to door handles, will look great in silver. Sure, it is possible to equip an entire room with mirrored furniture, but the arrangement will look obtrusive. A more impressive idea on matching firm furniture would be to go with high gloss and glass. The arrangement will be in tune with mirrored console table without drawing too much attention. 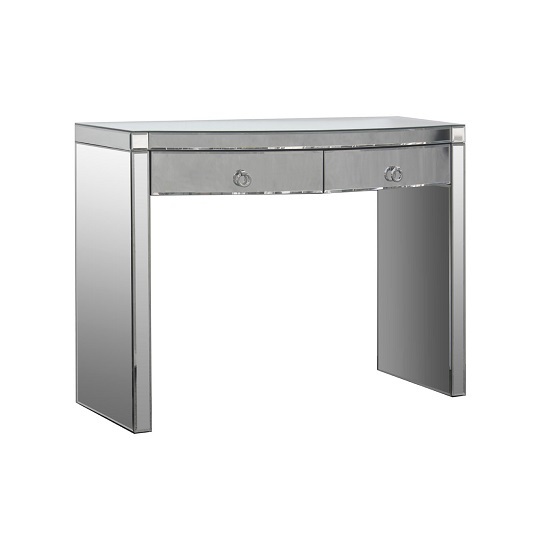 Glass mirrored console table, like any other mirrored furniture in general, is already a very eye catching decoration solution, so you will not need to accessories heavily. In fact, staying minimalistic and going with functional furniture only, is the best idea while working with furniture that is already bright and stylish. When it comes to soft furniture, leather is a one of a kind example that will look great anywhere — in rooms with mirrors, glass, or wood. Going with a rough and plain design will make the room minimalistic and memorable at the same time. This is the best idea for ultra modern living rooms, showcasing your unique decoration taste and making the interior unforgettable. Mirrored furniture will look very impressive next to light walls — not necessarily white, but light. To make the environment more contrasting, one wall may feature a darker shade. A couple of vertical lines in the doorway area will also make the room look fresh and unusual. Finally, a console table should not be empty. A designer lamp or a crystal vase are some of the obvious pieces that can stylishly accessorise the table.